Julia F. Aravich, age 95 of DuBois PA, passed away Tuesday, April 16, 2019 at her home. Born on June 10, 1923 in Brockway, PA, she was the daughter of the late Achelle and Carolina Marchiori. On August 13, 1949, she married her husband of 57 years, Joseph M. Aravich. He preceded her in death on June 2, 2009. Julia was a 1945 graduate of the Indiana School of Nursing with an RN degree. 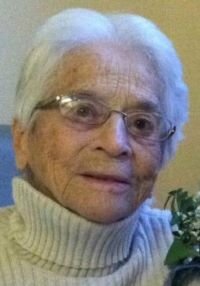 In nursing school, she was a Cadet Nurse during World War II. While in Indiana she was a second-floor supervisor at the Indiana Hospital. In DuBois, she worked private duty at the local hospitals, second floor at the DuBois Hospital, home health, and as a school nurse for the DuBois Area School District, and DuBois Area Catholic School. She was known as "grandma" to the students. She was a member of St. Joseph Roman Church in DuBois, PA.
She is survived by two sons;(Thomas Aravich & his wife Brenda and Donald Aravich and his wife Karen) and one daughter (Carol Barber & her husband Larry) all of DuBois, PA. She is also survived by ten grandchildren and thirteen great grandchildren. Julia was the last surviving member of her immediate family. She was preceded in death by two brothers;(Valintino & Prospro Marchiori) and four sisters;(Alice Pinchock, Catherine Muth, Esther Aravich and Mary Pisarchick). Visitation will be held on Monday, April 22, 2019 from 2-4 and 6-8 PM at the Baronick Funeral Home & Crematorium, Inc.
A scriptural wake service will be held on Monday at 1:30 PM. The rosary will be prayed on Monday at 7:45PM. A Mass of Christian Burial will be celebrated on Tuesday, April 23, 2019 at 10 AM from St. Joseph Roman Catholic Church with Father Edward Walk as celebrant. Memorials may be made to DuBois Central Catholic, Box 567 DuBois, PA 15801.